Have you ever tried to write down your story? Like, the story of who you are and why you are the way you are, and the people who played a part in shaping you into this fully-formed human that you've become? Well, as of last week, I have. And let me tell you, it isn't easy. 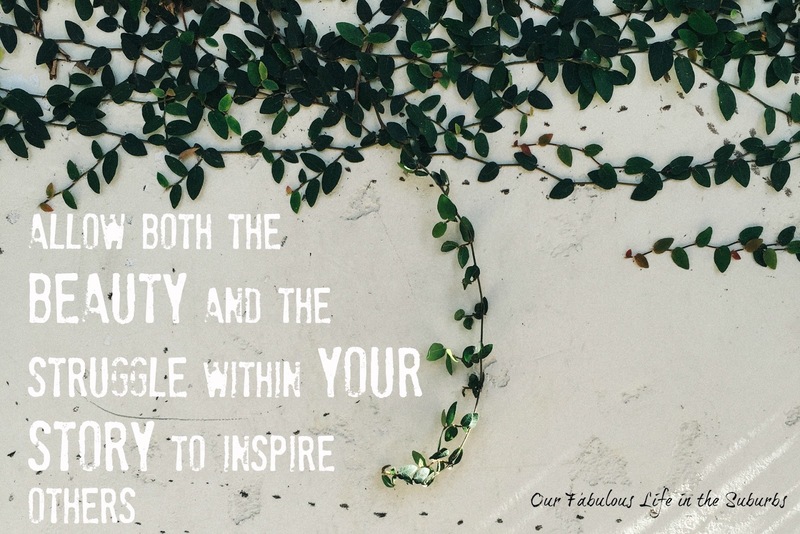 The table of ladies that I sit with at bible study have decided to share our stories - our stories of who we are and how we've come to the place that we are with God. Instead of finding a time to do this in person, because that would take an insane amount of time, we've decided to share them in our private Facebook group. So I'm now faced with the task of summarizing my entire life basically into a few paragraphs. These women have no idea what they got themselves into, because I am certainly not one for brevity. I am allll about the details, and I have a hard time holding back. I'm kind of an open book, which can be good and bad. So when I sat down to try and sum up 31 years of life, man - it was tough. It also made me look a bit closer at some of the things in my past that I rarely think about anymore. The people who have hurt me. The reasons I stayed away from church for so long. The intense dislike I had for everything related to Christianity for so many years, and the feelings behind that. I started to remember details that I think I'd suppressed. It caused me to peek into some moments in my life that make me feel a little nauseous when I think about them. But it also made me feel so incredibly grateful. So grateful for the upbringing that I had, the morals that were instilled, the security that I have always had knowing how loved and cherished I am. It made me grateful for the hard lessons that I've had to learn, for the painful challenges that I've overcome. It let me see that even when I had completely turned my back on God, that He was right there. I have no doubt that He has guided my steps throughout my life. Every little thing that I've experienced has taught me something in some way. The hardest things that I swore would actually kill me at the time - I learned SO many incredible lessons from them. It was all worth it. It led me to this place. Even though my husband and I have not been seeking God throughout our relationship, I know for a fact that God has been guiding us. And to be honest, it's mainly me that has not been seeking Him. My husband has an unshakeable faith, and prays on a regular basis and has always felt that everything happens for a reason. I have been the doubter, the pessimist, the one who at times felt hopeless. His faith has honestly helped to carry me through over the years. But now that I'm on this path of seeking God and His will for my life, I can so clearly see that my past has had a great purpose. I don't know how it will be used, but I know that there are parts of my story that will help others. There are other women out there who can absolutely relate to the things that brought me to this point. My story is my own, it is unique and beautiful and hard and sad and full of joy, all at once. If you haven't ever taken the time to write down your own story, I highly encourage it. It honestly felt a bit like a therapy session, combing through all of the details and making note of the ones that influenced me the most. Self discovery and reflection seems to be a big part of this faith journey, at least for me, but I must say that it has been incredibly enlightening and healing in many ways. Oh wow, that could get really interesting. I've never taken the time to think about my story and the big things that have shaped who I am. I really just might give that a try.